Why Is Bill de Blasio Afraid of Safer, Saner Streets? It was hard to miss mayoral candidate Bill de Blasio as he made the media rounds yesterday. After positioning himself as the “outer borough” candidate on the local Fox morning show, de Blasio — who voted against congestion pricing and the transit funds that would have come with it — traveled to Washington Heights to shake hands with straphangers. All of us, including those of us who drive cars, such as myself, we don’t necessarily seek out Times Square. I’m glad our tourist friends do, which has been very good for the city. But that’s a tall order. Maybe the greatest asset of Times Square being the Theatre District around it, maybe that’s the ticket. But I’ll have to give that one some thought. Okay, we get it: De Blasio is competing with Bill Thompson and John Liu for the anti-Bloomberg mantle. But what’s so hard about saying that Times Square is more inviting now that pedestrians aren’t spilling out into traffic because the sidewalks are so crowded? Where is the harm in acknowledging that business is booming now that people have room to walk, stand and, yes, take a seat at the Crossroads of the World? One of the memes of the de Blasio campaign is that New York is “a tale of two cities.” He has a point. There’s the distorted city as seen through the windshield glass, and there’s the city as experienced by the car-free majority. 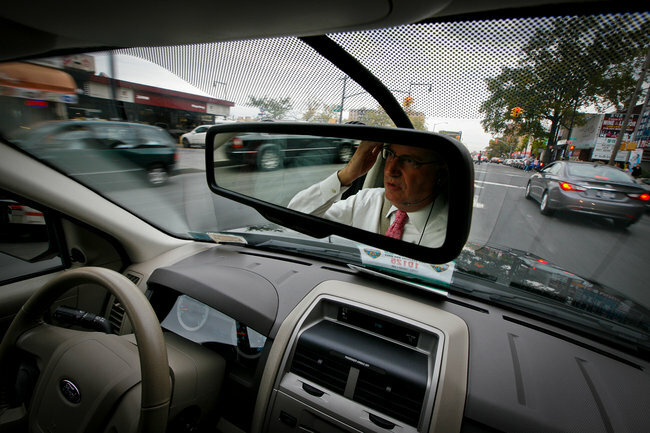 So far, de Blasio has identified himself squarely as a motorist. The New York Times informed everyone last October that he drives himself to events. But when was the last time he rode the bus, took a crowded train, walked across a street like Queens Boulevard, or shared a street with motorists while he was on a bicycle? New Yorkers who don’t drive everywhere want to know. If New York is “two cities,” which city does DiBlasio represent? The working class New Yorkers who are struggling to cover rent and support their kids aren’t driving around like he is, they’re being walloped by fare hikes and stuck on crowded trains and buses. What exactly is DiBlasio doing for them? Just remember when the day after the primary, the winner suddenly cares about the ordinary people who aren’t among the bonus rich or the years in retirement rich, who aren’t in the executive/financial class or the political union class. The truth is what might leak out while they are seeking votes among the self interested people who show up at primaries, collect signatures, and make big campaign contributions. And there won’t be much of a choice thereafter. The rot starts at the lower levels, and rises to the top. As long as most people only pay attention to elections for Mayor and President, these folks will keep doing what they do. Here’s a question. Under the last Democratic Mayor, David Dinkins, New York City cut off city tax funded support for the MTA Capital Plan. Despite two economic booms in the interim, it was never restored. Will your administration restore city tax support for the MTA, above the bare minimums now required? And what taxes will you increases or services will you cut to pay for this? As long as de Blasio depends on favorable coverage from the Post he’s going to say mealy mouthed stuff like this that has him both loving and hating popular projects like pedestrian plazas at the same time. Courage! Put this link on DeBlasio’s Facebook page, I just did. Maybe he’ll respond. Considering that the likely Republican nominee is the outgoing chair of the MTA, you’d think the Democrats would talk a better game on transit. I may be about to cast my mayoral vote for a Republican for the fourth time in a row — and I’m a registered Democrat. The NYC Democrats have the same problem as the national Republicans. The people they have to pander to in order to win the primary. DeBlasio has not impressed in any way shape or form. I am gonna start bad mouthing him to every one of my friends when they start talking about who they should vote for as next mayor. I’ve given up on the guy. He seems nice. But have waited. And waited. And waited to hear anything out of his lips that is not calculated. The city would suffer under DeBlaiso in the transportation sphere and just about every other category except maybe schools. I may have to hold my nose and vote for Quinn, or – yipes! – even Lahota. He is unfortunately a status quo guy who focuses on courting the vote of status quo type people. I actually think on some level he believes in transportation alternatives but lacks the political courage to alienate who believes to be his core supporters. And one thing this city definitely does not need is an uncourageous leader. The “anti-Bloomberg” mantle is more about out-Bloomberging Bloomberg. Rigidity to the point of intractable irrationality is the hallmark of Bloomberg, and virtually all Democrats are trying to be more rigid. They’ll keep the Ray Kelly authoritarianism and ignore transit, but will drop the street-level improvements that Bloomberg actually deserves credit for. Bloomberg’s pedestrian improvements are great. Now it takes 45 minutes to go 30 blocks in Manhattan, instead of 20, as it did prior to Little Napoleon. I did vote for DeBlasio, he named Polly Trottenberg the DOT Commissioner (a great choice), and he and Trottenberg are committed to Vision Zero. It’s all good! Responding to a frustrated Staten Island motorist on WNYC, Mayor de Blasio announced that the city will release a "bigger plan to address congestion" in the "coming weeks." The Republican contest to go up against Mayor Bill de Blasio is barely underway and candidates are already competing for who can stake out the most retrograde positions on streets and transportation policy.